Olives have held a place of prestige in a wide range of cultures for thousands of years. If grapes have a rival for a food with the most historical importance to Western civilization, surely it is the olive. Native to the Mediterranean basin, the olive tree and its fruit, which is technically a drupe, have held a special meaning for almost every culture and religion in the region. Ancient societies revered olives for much more than the tree’s long life and its importance to their agriculture. Many ancient peoples considered it a gift from the gods. Olives, olive oil and the olive branch have maintained their special, even sacred, symbolic meaning through the centuries. The leafy branch of the tree has been used as a sign of virginity and purity at weddings, a symbol of peace, a sign of power to crown victors of bloody wars and a sign of wisdom. The symbolism is as important and present today as ever. Offering a hand of friendship to a foe is known as extending an olive branch. Even the United Nations flag features two stylized olive branches wrapped around a world map — a sign of peace for all people. And olive oil, long considered sacred, continues to be used in many religious ceremonies. The earliest fossil evidence of olives was found at Mongardino, Italy, in leaves that date to the 12th millennium B.C., according to a history compiled by the International Olive Council. Situated in Madrid, Spain, the IOC is the world’s only international intergovernmental organization in the field of olive oil and table olives. Other early records of olives have been found in North African fossils from the Paleolithic Period, when humans first started using stone tools, and in parts of Bronze Age olive trees found in Spain. Although some believe these locations indicate that the tree is indigenous to the entire Mediterranean basin, the IOC says the olive tree originated in the thick forests of Asia Minor. The only ancient civilizations in the area that were not familiar with the olive tree were the Assyrians and Babylonians. “Olives have been cultivated in the Mediterranean since at least 2500 B.C.,” said food historian and author Francine Segan of New York. Considerable progress in cultivation of the tree took place in Syria and Palestine, although accounts differ about how the tree reached these regions. From there it moved to the island of Cyprus, to Egypt, to the Greek Isles in the 16th century B.C. courtesy of the Phoenicians and then, in the 6th century B.C., westward to Sicily and southern Italy. The Romans continued the expansion of the tree throughout the Mediterranean using it as a peaceful weapon to settle people and regions in their conquests. Segan included a passage about a fondness Cato (234-149 B.C. ), the Roman orator and statesman, had for olives in her book “Philosopher’s Kitchen.” Segan explained that Cato wrote a book about small farm management in which he detailed a recipe for chopped olives mixed with herbs and spices to be eaten at the start of a meal. Green, black or mixed olive relish to be made thus. Remove stones from green, black or mixed olives, then prepare as follows: Chop them and add oil, vinegar, coriander, cumin, fennel, rue, mint. Cover with oil in an earthen dish, and serve. Olive farming spread to the New World in 1492 with the Christopher Columbus’s first voyage to America. By 1560, olive groves were being cultivated in Mexico and South America. Today, olive trees are farmed in places as far removed from the Mediterranean as southern Africa, Australia, Japan and China. Although there are different kinds of olives, humans learned long ago that they couldn’t pick and eat the majority of them right from the tree as they would an apple. Olives are too bitter for that because they contain a compound called oleuropein. They are also low in sugar. To become palatable as table olives, the fruit typically has to undergo a series of processes to remove the oleuropein. In most cases, the few olives that are exceptions to this rule sweeten on the tree though fermentation. Apparently it was the bitter taste of freshly picked olives that led early human civilizations to find another use for olives. 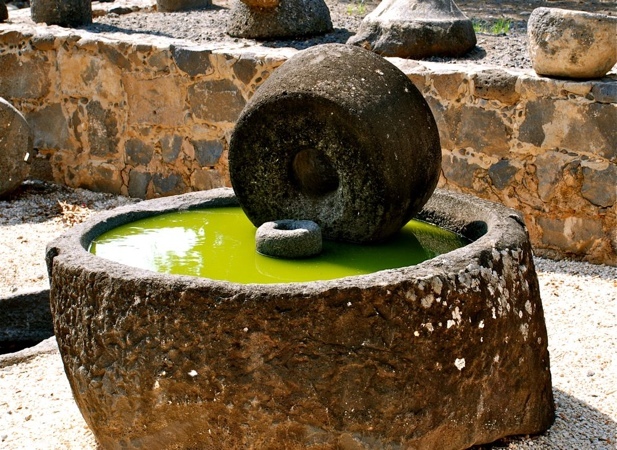 That use was to press them (with devices like those at Capernaum, Israel, pictured at right), extract the oil and then use the oil for a variety of purposes. Originally, cooking wasn’t one of those purposes. It was these many uses for the oil — lamp fuel, pharmaceutical ointment and as an anointment for religious leaders, royalty, warriors and others — that led the ancients to domesticate the olive tree. 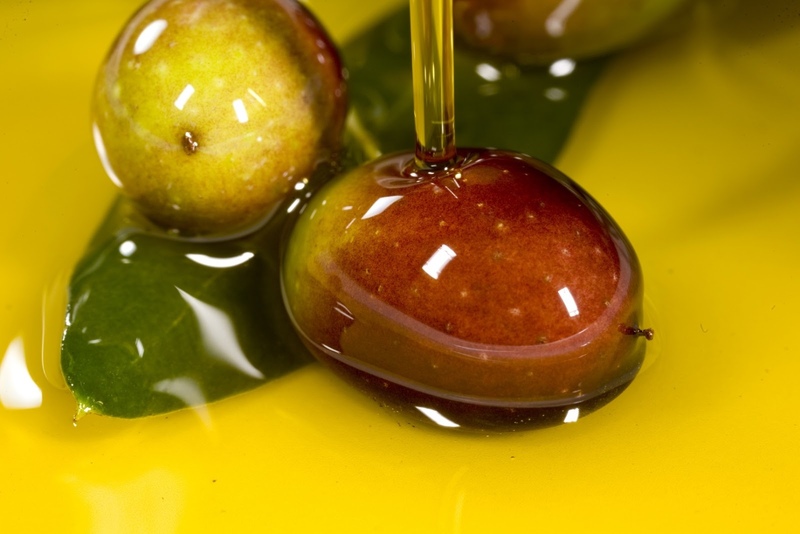 The production of olive oil is believed to have occurred no earlier than 2500 B.C. 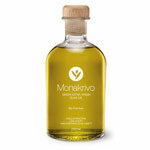 Olive oil wasn’t used for cooking until about 2,000 years later, in the fifth or fourth century B.C. Once again, the Romans were responsible for significantly increasing olive oil production, which occurred between 200 B.C. and 200 A.D.
Olive oil — along with all the other vegetable oils — is high in fat, which means it is high in calories. It’s also considered to be a healthy food. This sounds like a contradiction, but it isn’t. That’s because the main fat in olive oil is monounsaturated fatty acids, or MUFAs. MUFAS have been found to lower total cholesterol levels and low-density lipoprotein cholesterol levels. As a result, MUFAs may decrease the risk of heart disease in some people. They may also normalize blood clotting. MUFAs may even benefit people with Type 2 diabetes because they affect insulin levels and blood sugar in healthful ways. As with many good things, olive oil has a “but.” In this case, it’s that olive oil should be used in moderation because even healthful fats are high in calories. It’s also a good idea to use MUFAs instead of, rather than in addition to, other fatty foods such as butter. The world’s top four producers of olives are Spain, Italy, Turkey and Greece, according to the IOC’s executive secretariat. The four main producers of olive oil are Spain (1.27 million tons), Italy (408,100 tons), Greece (284,200 tons) and Turkey (178,800 tons). The four leading producers of table olives are Spain (533,700 tons), Egypt (407,800 tons), Turkey (399,700 tons) and Algeria (178,800 tons). These figures are an average of the past six crops, according the IOC. One of the trends in olive consumption, the secretariat said, is the rise of olive popularity in the Persian Gulf countries of Kuwait, Bahrain, Iraq, Oman, Qatar, Saudi Arabia, the United Arab Emirates and Yemen. That, it seems, is fitting. Just as olive farming has moved around the world, the consumption of one of the world’s most important foods has come full circle, back to the part of the world where it originated so many millennia ago.